Kitchen is the most important part of a house, and thus it needs to be well organized and perfectly furnished. Along with aesthetic values, it is important to make the kitchen a safe place. Kitchen safety is important for the overall safety of the household. This is why the kitchen should not be a congested place. Any high flammable items should not be stored in kitchen. If you think that your kitchen lacks safety, it is the time to go for kitchen renovation. This is the reason why you need to find a kitchen planner in Pimpri and Chinchwad. If you have bought a new apartment, kitchen planning service is also needed for furnishing the kitchen. In Pimpri and Chinchwad, finding kitchen planners is not difficult. Many services are there, but you need to make sure that you find an experienced and certified service provider. What are some of the most suitable kitchen plans in Pimpri and Chinchwad? Pimpri and Chinchwad is a city of Maharashtra, and it is a rapidly growing city. Once a suburb, the place has undergone rapid changes over the last few years. It has many newly constructed residential projects as well as independent villas. A lot of restaurants, as well as commercial buildings, are also coming up. Both residential places and commercial buildings need kitchen planning service. According to the weather condition, kitchen planning has to be done. This is why the following kitchen plans are suggested for people in Pimpri and Chinchwad. Nautical kitchen style is an open plan kitchen, featuring an airy atmosphere. Such a kitchen type is suggested for the small apartment owners in Pimpri and Chinchwad. When the kitchen space is small, this type of open kitchen design will make the place hygienic, airy and safe. Vintage kitchen designs is good for the traditionally designed house and wooden furnishing is generally suggested with such kitchen plan. Since Pimpri and Chinchwad experiences good amount of rainfall during monsoon in India, good quality wood or timber has to be used. For homes with a large kitchen space, kitchen islands can be considered. Featuring the cooktop at the center, this design is cool as well as elegant. The design includes a dining area into the kitchen. However, traditionally in India dining space and kitchens are not coupled together. This design is suitable for a holiday home, guests houses, rented houses, etc. The L shaped modular kitchen design is quite popular in contemporary houses and apartments. The L-shaped cooktop is the main part of the kitchen. Both square and rectangular kitchen spaces can be turned into L-shaped design for the kitchen. And for those, who think that L-shaped kitchen design is too common, U-shaped kitchen design is a good option for them. You need to look for professional kitchen planner in Pimpri and Chinchwad, as they can provide you with perfect design for your kitchen space. What are some points to remember for before starting kitchen planning in Pimpri and Chinchwad? Designing a kitchen is not an easy task, as it involves different sorts of complications. Thus, proficient kitchen planners have to keep a lot of things in mind. The most important thing is to maintain safety standards. Based on the available space for a kitchen, safety standards are to be followed. The kitchen should have enough space for moving around easily. 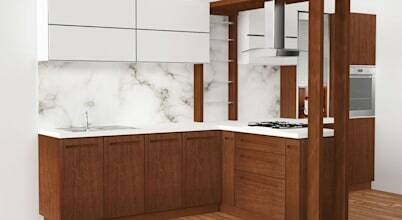 In small apartments, kitchen space is not so large, minimal modular kitchen design is a perfect option in such a kitchen. At least two people should find the space to move freely in such a kitchen. If space is too low, it is wiser to convert the kitchen in an open kitchen design. In hot and humid conditions, wooden furnishing in the kitchen may easily get damaged. This is why kitchen planner in Pimpri and Chinchwad suggest going for good quality hardwood furnishing. Ply or wood quality should be good. The alternative option is to go for metallic furnishing. What is the cost for kitchen planning in Pimpri and Chinchwad? Modular kitchen for small apartments starts from 50K (Indian rupee). On the other hand, large kitchen furnishing would cost obviously higher. In such cases, kitchen furnishing packages could start from 2-3 lakh. Is it important to consult a professional kitchen planner? For renovating or designing a kitchen for residential places as well as commercial places like hotels, restaurants, and others, consulting a professional kitchen planner is absolutely important. Professional kitchen planner in Pimpri and Chinchwad typically charge 8-10% of the kitchen design project. For kitchen design or renovate at commercial places, the charge is higher. What are some tips to find professional kitchen planner in Pimpri and Chinchwad? To find kitchen planner in Pimpri and Chinchwad, you can check homify which is the online platform for featuring location-based kitchen planning services. The website has a listing for different cities. Certified as well as registered kitchen planners can be found through homify. You shall get the genuine service from proficient kitchen planners.